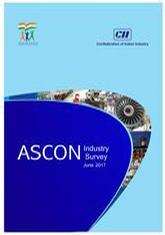 The CII ASCON Survey, which tracks the growth of the industrial sector through the responses collected from sectoral industry associations, reveals slight improvement in growth trends in terms of production in Q1FY18 quarter over the corresponding quarter a year ago. However, the pace of recovery continues to be on the slow track in the surveyed quarter. This work is a product of the staff of The World Bank with external contributions. Note that The World Bank does not necessarily own each component of the content included in the work.